If you are looking for professional commercial cleaning in Melbourne we are here to serve you. Our experienced staff goes into many commercial business premises around this fine city to do the cleaning so that management, employees and clients can all enjoy a sparkling clean place to work in. Having a clean office will certainly help your employees to enjoy their working day and ensure that illness and allergies are kept to a bare minimum, if not removed altogether. Dust and other allergens will get into the air conditioning if they are not removed on a regular basis. This will simply spread it all around from floor to floor and anyone that suffers from asthma or hay fever will have a miserable time working in the building. They may even have to leave their job because of it, causing project delays and extra costs for the business. 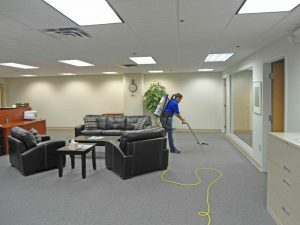 So keeping your offices clean can save your business from having to find new staff all the time. A great deal of office cleaning in Melbourne is handled by us as we offer a range of cleaning services to assure the cleanliness of your business. We will come into your offices and clean everything that needs it, from the furnishing and fixtures to the carpets and windows. We clean and polish hard floor surfaces and ensure that there is no dust on the light fittings or high surfaces that are out of sight. We are also careful not to disrupt your working day while we go about our cleaning, but can also schedule times to suit you better.